Reigning Polish champion GM Mateusz Bartel won the 2012 edition of Aeroflot Open that took place 7-15 February in Moscow. Bartel collected 6,5/9, the same points as Pavel Eljanov and Anton Korobov, but had better first tiebreak (more games with black) which puts him on first place in the final standings. Bartel started with draws against Grzegorz Gajewski, Evgeny Tomashevsky, and Ray Robson, but quickly entered in strong rhythm defeating Ivan Popov, Krisnan Sasikiran, and Fabiano Caruana. Being close to the top, he secured the first place with solid draws against his direct opponents Eljanov and Korobov. 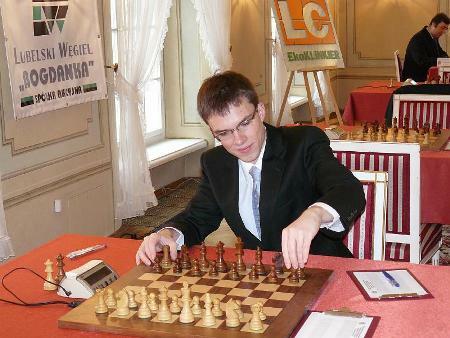 The 26-years old Polish Grandmaster is currently rated 2658 FIDE ELO. He was U18 European Champion in 2003 and vice-champion in 2002, vice-champion of the European Union in 2005 and Polish Champion in 2006 and 2010. On the international chess scene, he was winner in Legnica (Poland) 2001, Drammen International (Norway) 2004/2005, I Open Illes Medes (Spain) 2006/2007, Monarch Assurance International (Isle of Man) 2007, Open International d’Escacs de Sants 2008. The recent win in Aeroflot is continuation of Mateusz Bartel’s recent strong performances in the Polish Championship, Banícky Kahanec, European Club Cup, etc.